The Legend of Tarzan is a 2016 adventure film based on the fictional character created by Edgar Rice Burroughs. Directed by David Yates, with a screenplay by Adam Cozad and Craig Brewer, the film stars Alexander Skarsgård as the title character, with Samuel L. Jackson, Margot Robbie, Djimon Hounsou, Jim Broadbent, and Christoph Waltz in supporting roles. Principal photography began on June 21, 2014, at Warner Bros. Leavesden Studios in the United Kingdom and wrapped four months later on October 3. The film premiered at the Dolby Theatre in Los Angeles on June 29, 2016, and was theatrically released in the United States on July 1, 2016, in 2D, 3D, IMAX and IMAX 3D. The film grossed over $356 million against a budget of $180 million and received mixed reviews from critics. As a result of the Berlin Conference of 1884-1885, the Congo Basin is claimed by King Leopold II of the Belgians, who rules the Congo Free State in personal union with the Kingdom of Belgium. The country is on the verge of bankruptcy, Leopold having borrowed huge sums of money to finance the construction of railways and other infrastructure projects. He sends his envoy Léon Rom (Christoph Waltz) to secure the fabled diamonds of Opar. Rom's expedition is ambushed and massacred. A tribal leader, Chief Mbonga (Djimon Hounsou), offers Rom the diamonds in exchange for an old enemy: Tarzan. The man once called "Tarzan", John Clayton III (Alexander Skarsgård), has left Africa behind and settled down in London with his American-born wife, Jane Porter (Margot Robbie). He took up his birth name and ancestral family residence as Lord Greystoke. In the eight years since returning from Africa, John's story as Tarzan has become legendary among the Victorian public, although John wants to leave that past behind. Through the British Prime Minister (Jim Broadbent), John is invited by King Leopold to visit Boma and report on the development of the Congo by Belgium; he declines to participate in the perceived publicity stunt. An American envoy, George Washington Williams (Samuel L. Jackson), privately reveals his suspicions that Leopold is enslaving the Congolese population to increase rubber production to recoup his debts. Williams persuades Greystoke to go to the Congo in order to prove his suspicions. Jane is thrilled to "go home" to Africa and see the friends and family she grew up with in the tribal village where her father taught. Greystoke says that she should not come, as he thinks the trip would be too dangerous. Jane recently had a miscarriage and he remembers the harshness of the jungle. Jane reminds him that she grew up in Africa as well, and misses her home and friends there. John relents, and allows Jane to accompany him after she promises to stay with the tribe while John and Williams investigate. John, Jane, and Williams take the trip to the Congo. There, the trio circumvent the diplomatic envoy and travel solo to the tribal village of their youth. The village celebrates reuniting with their friends. Jane explains to Williams that her husband was once considered an evil spirit by the African tribes. Jane was an object of curiosity to the young Tarzan, and Tarzan revealed himself to Jane during a childhood game of hide and seek. Frustrated by John's deviation from the travel plan, Rom and his mercenaries raid the sleeping village after the celebration. They kill the tribe's leader, capture John and Jane, and kidnap several villagers for use as slaves. John is rescued by Williams, but Rom's crew takes the remaining captives, including Jane, on board their steamship traveling on the nearby river. Rom intends to use Jane as bait to lure John, and is surprised and admiring of Jane's vibrant tenacity and ferociousness. Rom also reveals that John's state invitation from King Leopold was engineered by Rom, and Rom intends to deliver Tarzan to Chief Mbonga. John and Williams, with the aid of the tribe's remaining warriors, travel through the jungle, hoping to use the new Belgian railway to intercept the steamship and rescue their loved ones. After a struggle to overtake a Belgian military train, the group discovers the train is carrying captured slaves and find a ledger detailing the Rom's government-sanctioned plan to take over the Congo using slaves, the railways, and a massive mercenary army. The only thing needed are the Opar diamonds; King Leopold has nearly bankrupted his country paying for the initial stages of the plan, and requires the diamonds to pay for the army of mercenaries needed to complete his hostile takeover and see a return on his investment. With the ledger, William now has the evidence he needs to expose King Leopold. John and Williams task the warriors with returning the released slaves to their homes and then delivering the ledger to the port city of Boma via the railway as John and Williams continue on through the jungle to catch the steamship. As John and Williams continue, John encounters the adult Akut, who was raised as his ape brother and now is leader of the apes. Aware that Akut considers him a deserter, John must fight Akut for permission to travel through their territory. John soon loses, but the pair are permitted to travel on. John remembers saving a young Jane's life by shielding her from Kerchak's attack when they were teens, suffering severe injuries. Jane took the injured Tarzan home, starting their relationship. As John recovers from his recent fight, Williams recalls the massacres of Native Americans during the Indian Wars, comparing them to the abuses of Rom and Leopold. Jane escapes Rom's clutches on the steamship, jumping from the boat and swimming to the shore as the remaining captured villagers escape to rally extra forces. Her flight through the jungle is halted when she stumbles into a group of mangani apes, and must make a show of deference to avoid them attacking. Rom approaches the apes, making the gesture of deference as Jane promises to return with Rom in exchange for the apes being unharmed, but Rom's nervous men shoot, leading to slaughter. John saves the remaining apes, reconciling with Akut, before pursuing Rom, who is now fleeing in the direction of Mbonga's tribe with Jane in tow in the hopes of delivering Tarzan to them and receiving his payment of diamonds. John is cornered by Mbonga and his tribe. It is revealed that John had earlier killed Mbonga's only son, who had killed Kala, John’s adoptive ape mother. A defeated Mbonga accuses John of lacking honor, as his son was just a young boy when John killed him. John spares Mbonga, just as Akut and the manganis arrive to subdue the tribe. Rom takes Jane and the diamonds to Boma, where he plans to take control of the mercenary army waiting offshore. John triggers a massive stampede of wildebeest through Boma, destroying the town and soldiers. John rescues Jane. As Rom attempts to escape by boat, Williams sinks it with a machine gun as John swims aboard. Rom incapacitates John by strangling him and then tying him by the neck to the ship's railing, before trying to escape again. John summons crocodiles with a mating call to devour Rom, before escaping the destroyed vessel. Williams returns to England and presents the Prime Minister with evidence exposing the slave trade and abuses of the Congolese in the Belgian-held lands. One year later, John and Jane have settled in Africa, in the old house of Jane's father. John returns to his place among the great apes as Tarzan and celebrates Jane having their child. Alexander Skarsgård as John Clayton III / Tarzan, 5th Baron Greystoke. On his character Tarzan, Skarsgård said, "This is about a man who’s holding back; and slowly, as you peel off the layers, he reverts back to a more animalistic state and lets that side of his personality out." To get in Tarzan shape, Skarsgård spent four months in a training regimen before principal photography started and gained 24 pounds. Part of his training was for movement work with choreographer Wayne McGregor. Christoph Waltz as Captain Léon Rom, a corrupt merciless Belgian captain sent by King Leopold of Belgium to find diamonds and control the region. Djimon Hounsou as Chief Mbonga, the leader of the leopard men of Opar (an African tribe that controls the diamond region), who wants revenge against Tarzan for the death of his son. Matt Cross as Akut, Tarzan's adoptive ape brother, Kala's biological son, and the current leader of the Mangani. An updated version of Tarzan had been in the works since at least 2003, with John August writing. However, by 2008, it was reported that a different version, co-written by Stephen Sommers and Stuart Beatle, that was said to resemble the Pirates of the Caribbean series, was in development. By 2011, Craig Brewer, who also rewrote a version of the script, was set to direct the film, although this did not come to pass. Instead, David Yates was chosen to direct in 2012. Other directors in the running included Susanna White and Gary Ross. In April 2013, it was reported that the production was temporarily suspended due to budgetary concerns. For a while, producer Jerry Weintraub (no relation to the 50s and 60s Tarzan producer Sy Weintraub) wanted swimmer Michael Phelps to play the title role, feeling that he was the heir apparent to Johnny Weissmuller, the actor who had famously played Tarzan, and who was also a prominent competitive swimmer. Weintraub reportedly changed his mind after watching Phelps host Saturday Night Live, for only two minutes. Other early contenders for the role included Henry Cavill, Tom Hardy, and Charlie Hunnam. On November 14, 2012, Alexander Skarsgård was cast in the title role, the choice of director Yates, while Samuel L. Jackson was being eyed to play Williams in the film. Yates found Skarsgård to be the perfect Tarzan. He liked that he was born in Sweden but had found a career in America, so "he has this wonderful quality of not quite belonging to one or the other", he said. On March 6, 2013, it was reported that Yates wanted Jessica Chastain to play the female lead role, Jane Porter. On September 26, 2013, Christoph Waltz was in talks to play the villain in the film; he was later cast, as Captain Rom. The studio eyed Margot Robbie and Emma Stone to play the female lead character, Jane Porter. Emma Watson (who worked with Yates on the last four Harry Potter films), Sarah Bolger, Georgina Haig, Lucy Hale, Lyndsy Fonseca, Eleanor Tomlinson, Gabriella Wilde, Lucy Boynton and Cressida Bonas were all considered for the part. On January 18, 2014, Robbie was confirmed to play the female lead, Jane, in the film, opposite Skarsgård, beating Stone for the role. On June 4, Djimon Hounsou was set to play Chief Mbonga in the film. On June 17, Osy Ikhile was added to the cast to play a supporting role, but the character was not then named. Casper Crump was cast to play Captain Kerchover. The release of the first trailer in December 2015 revealed that Jim Broadbent was also part of the cast. Principal photography on the film commenced on June 30, 2014, at Warner Bros. Studios in Leavesden, Hertfordshire, England. Filming had begun on the day an announcement was made for the expansion of the studio. Filming wrapped the same year on October 3. Filming took place for a total of 70 days. According to The Wall Street Journal, shooting the film in Africa would have made the budget even higher. Making Africa seem authentic was especially important to the filmmakers, since the film was shot in England, except for six weeks in Gabon, filming background by helicopter without the cast. A working waterfall and a 100-foot-long collapsible pier were assembled at Warner Bros.’ Leavesden studios. Seven versions of the African jungle were constructed to show different scenery throughout the filming. Plants from Holland were mixed with trees sculpted by the art department. Kedleston Hall stood in for the Greystoke Manor, and a cedar tree on the grounds of Highclere Castle served as the setting for an early pivotal scene between Tarzan and Jane. The film's score was composed by Rupert Gregson-Williams. The soundtrack was released on June 16, 2016 by WaterTower Music and on CD on June 24, 2016. Tony Clarke, Thomas Farnon, and Tom Howe are credited for additional music. Hozier provided a single, Better Love, which is played at the film's end credits. All music composed by Rupert Gregson-Williams, except where noted. The film was released on July 1, 2016 by Warner Bros., in traditional formats as well as 3D and IMAX 3D. The film was released in October 11, 2016, in traditional formats, Blu-ray, DVD and 4K Blu-ray. The Legend of Tarzan grossed $126.6 million in the United States and Canada and $230.1 million in other territories, for a worldwide total of $356.7 million. Given its $180 million production budget, it would have had to have earned at least $400 million to break even and justify a sequel. Deadline Hollywood's financial analysts stated that the film lost the studio an estimated $40 million, although the studio itself asserted the film broke even. In the United States and Canada, The Legend of Tarzan opened alongside The BFG and The Purge: Election Year, and was projected to gross to $25–33 million in its opening weekend. It opened Friday, July 1, 2016 across 3,561 theaters and 6,700 screens, and grossed $14 million on its opening day, including $1.4 million in IMAX showings. This includes $2.6 million it made from Thursday night previews. In its opening weekend, buoyed by positive word of mouth, the film grossed a better-than-expected $38.5 million, of which IMAX contributed $3.9 million, and $45.6 million over its four-day Independence Day holiday frame, finishing second place at the box office behind Finding Dory, but first among new releases. However, despite its opening numbers, Deadline called the film a "dud", due to its lofty budget. Internationally, The Legend of Tarzan received a scattered release pattern, in order to take advantage of the competitive landscape surrounding the 2016 European Championship. It is likely that a recoup of the film's hefty production budget will be dependent on international audiences and returns. Jeff Goldstein, Warner's executive vice president of domestic distribution, told The New York Times, "This property has always really been about the international opportunity." The film opened across 19 markets on the same weekend it debuted in North America, including major territories like Russia and South Korea. In its opening weekend, it grossed $19.3 million on about 6,700 screens, and an IMAX total of $1.2 million from 122 IMAX theaters. In Russia and the CIS, it opened with $3.1 million, debuting in first place at the box office. However, it was the lowest No. 1 opening for a film since April, while in South Korea it debuted at No. 2, with $4 million. In the latter market, it faced significant competition from local films Familyhood and The Hunt, both of which performed strongly. In the United Kingdom and Ireland, it came in second place with $4.7 million, including previews, debuting behind the animated The Secret Life of Pets, and in Australia with $3.2 million, behind Finding Dory. Elsewhere, Asia had No. 1 openings in India, Indonesia, Thailand and Malaysia. The studio also reported No. 1 debuts in Mexico ($4.6 million), Brazil ($3.4 million), Spain ($1.8 million), Italy ($1.6 million), the majority of Eastern European markets, and Puerto Rico. Germany ($2 million), the UAE ($1.6 million), and Japan ($1.5 million) had similar opening figures. In China – the film's second biggest market – the film was granted a rare release date in the month of July, a peculiar move since July is typically the month when Chinese regulators ban foreign films (including Hollywood films) in order to protect and promote their own local films. It opened on Tuesday, July 19, and made $7 million on its opening day. It went on to deliver a six-day opening of around $27 million and a three-day weekend opening of $12 million. 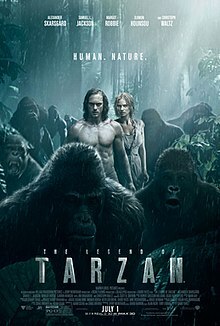 Although the opening number was regarded strong, it came in second place, behind Skiptrace, which occupied a market share in excess of 56%, in comparion to The Legend of Tarzan's 16%. In terms of total earnings, its biggest markets outside of the United States are China ($45.1 million), Mexico ($13.7 million) and the U.K. and Ireland ($11.9 million). The Legend of Tarzan received generally mixed reviews from critics. On Rotten Tomatoes, the film has an approval rating of 36% based on 225 reviews with an average rating of 5.1/10. The website's critical consensus reads, "The Legend of Tarzan has more on its mind than many movies starring the classic character, but that isn't enough to make up for its generic plot or sluggish pace." On Metacritic, the film has a score of 44 out of 100 based on 41 critics, indicating "mixed or average reviews". Audiences polled by CinemaScore gave the film an average grade of "A–" on an A+ to F scale. Manohla Dargis of The New York Times gave the film a positive review, stating "What makes it more enjoyable than a lot of recycled stories of this type is that the filmmakers have given Tarzan a thoughtful, imperfect makeover." In his review, Peter Travers of Rolling Stone stated "At least it's watchable. In summer, baby, that's high praise." Peter Debruge of Variety gave the film a negative review, stating "A talky and mostly turgid attempt by British director David Yates to build on the epic vision he brought to the final four Harry Potter movies via another beloved literary hero." Jordan Hoffman of The Guardian criticized the film for its story and writing, stating "Committed performances aren’t enough to save this film from uncomfortable colonial optics, uninspiring CGI and tedious plotlines." ^ "The Legend of Tarzan [2D] (12A)". British Board of Film Classification. May 26, 2016. Retrieved May 26, 2016. ^ "The Legend of Tarzan". June 27, 2016. Retrieved June 27, 2016. ^ a b c "The Legend of Tarzan (2016)". Box Office Mojo. Retrieved October 26, 2016. ^ a b c Brodesser-Akner, Claude (7 November 2012). "David Yates Committing to Tarzan at Warner Bros". Vulture. Retrieved 5 March 2014. ^ a b Kit, Borys (11 February 2014). "Warner Bros. Sets Release Date for Its 3D 'Tarzan' Movie". The Hollywood Reporter. Retrieved 5 March 2014. ^ a b Kroll, Justin (14 November 2012). "Alexander Skarsgard swings into 'Tarzan' frontrunner". Variety. Retrieved 5 March 2014. ^ a b c Truitt, Brian (December 5, 2015). "Sneak peek: 'Tarzan' puts a twist on a legend". USA Today. Retrieved December 9, 2015. ^ a b Iswarienko, Kurt (June 23, 2016). "Alexander Skarsgard, of Sound Mind and Body to Play Tarzan". New York Times. Retrieved June 24, 2016. ^ "How Alexander Skarsgard Got 'Tarzan' Fit". ^ a b Kit, Borys (26 September 2013). "Christoph Waltz in Talks to Play the Villain in 'Tarzan'". The Hollywood Reporter. Retrieved 9 March 2014. ^ a b Kroll, Justin (11 December 2013). "Samuel L. Jackson in Talks for 'Tarzan' at Warner Bros". Variety. Retrieved 5 March 2014. ^ Obenson, Tambay A. (February 11, 2014). "Samuel L. Jackson Confirmed For Tarzan Reboot. But Who Will He Play? Warlord Or Sidekick?". Indiewire.com. Retrieved September 24, 2014. ^ a b Sneider, Jeff (18 January 2014). "'Wolf of Wall Street' Star Margot Robbie in Talks for 'Tarzan' – She's Jane". TheWrap. Retrieved 5 March 2014. ^ a b Fleming Jr, Mike (4 June 2014). "Djimon Hounsou Joins 'Tarzan'". Deadline Hollywood. Retrieved 6 June 2014. ^ a b Orange, B. Alan (August 30, 2014). "First Look at Margot Robbie as Jane in 'Tarzan'". MovieWeb. Retrieved August 5, 2015. ^ Roger Evans [@rogergevans] (August 15, 2014). "An amazing day on Tarzan with @CliveBrunt @AlexKFerns and Simon Russell Beale. Gonna be brilliant. What a gent David Yates is" (Tweet). Retrieved September 24, 2014 – via Twitter. ^ "Warner Bros 'Tarzan' Casting Roles". StarNow.co.uk. Retrieved September 24, 2014. ^ Dunkley, Cathy (26 June 2003). "August ape for 'Tarzan'". Variety. Retrieved 9 March 2014. ^ McNary, Dave (2 September 2008). "Sommers in talks to direct 'Tarzan'". Variety. Retrieved 9 March 2014. ^ Spines, Christine (3 December 2008). "Tarzan preps big-screen return, 'Pirates of the Caribbean' style". Entertainment Weekly. Retrieved 9 March 2014. ^ McNary, Dave (2 June 2011). "Craig Brewer set to direct 'Tarzan'". Variety. Retrieved 9 March 2014. ^ Han, Angie (18 June 2012). "David Yates, Gary Ross, and Susanna White Circling One of Warner Bros.' 'Tarzan' Movies". /Film. Retrieved 9 March 2014. ^ Fleming Jr, Mike (10 April 2013). "'Tarzan' Dying On The Vine At Warner Bros?". Deadline.com. Retrieved 9 March 2014. ^ Harkness, Ryan. "Michael Phelps Was a Frontrunner to Play Tarzan — Until He Hosted 'Saturday Night Live'". Yahoo Movies. Uprox. Retrieved 9 July 2016. ^ Brodesser-Akner, Claude (7 November 2012). "David Yates Committing to Tarzan at Warner Bros". Vulture. Retrieved 9 March 2014. ^ Lussier, Germain (6 March 2013). "David Yates Wants Jessica Chastain For 'Tarzan'". /Film. Retrieved 9 March 2014. ^ Sneider, Jeff (17 June 2014). "'In the Heart of the Sea' Actor Osy Ikhile Joins Djimon Hounsou in 'Tarzan'". TheWrap. Retrieved 22 June 2014. ^ Gallagher, Brian (June 30, 2014). "Warner Bros. Expands Leavesden Studios as 'Tarzan' Begins Production". MovieWeb. Retrieved July 2, 2014. ^ Cox, Gordon (30 June 2014). "Warner Bros. to Expand Leavesden Studios as 'Tarzan' Starts Filming". Variety. Retrieved 1 July 2014. ^ Tartaglione, Nancy (30 June 2014). "Warner Bros Studios Leavesden To Expand In UK; 'Tarzan' Swings Into Residence". Deadline Hollywood. Retrieved 1 July 2014. ^ "On The Set For 10/06/14: Liam Neeson Starts A Monster Calls, Alexander Skarsgard Wraps Tarzan". SSN Insider. October 6, 2014. Archived from the original on October 8, 2014. Retrieved October 7, 2014. ^ Germain Lussier (June 14, 2016). "'The Legend of Tarzan' Set Visit: A Passionate Attempt to Reboot an Iconic Character". /Film. Retrieved June 26, 2016. ^ a b Lucy Feldman (June 23, 2016). "How 'The Legend of Tarzan' Got Modernized". The Wall Street Journal. Retrieved June 26, 2016. ^ a b Stamp, Elizabeth (June 28, 2016). "Tour The Legend of Tarzan's Far-Flung Filming Locations". Architectural Digest. Retrieved January 20, 2018. ^ "Hans-Zimmer.com - Tony Clarke". hans-zimmer.com. Retrieved July 30, 2017. ^ "Thomas Farnon : Credits". thomasfarnon.com. Retrieved July 30, 2017. ^ "Credits: Tom Howe". tomhowe.co.uk. Retrieved March 25, 2017. ^ www.hozier.com, Hozier - (15 June 2016). "Better Love - Hozier". ^ a b c Brent Lang (June 16, 2016). "'The BFG,' 'The Legend of Tarzan' Failing to Generate Much Box Office Heat". Variety. Retrieved June 23, 2016. ^ Anthony D'Alessandro (May 10, 2017). "'Guardians Vol. 2' Sending 'King Arthur' To The Dungeon — Weekend Box Office Preview". Deadline Hollywood. ^ Pamela McClintock (June 24, 2016). "July Fourth Box Office: Few Fireworks Expected as 'BFG,' 'Tarzan' Track Poorly". The Hollywood Reporter. Retrieved June 24, 2016. ^ Brad Brevet (June 26, 2016). "'Finding Dory' #1 Again, Topping All Four of the Weekend's New Wide Releases Combined". Box Office Mojo. Retrieved June 26, 2016. ^ Scott Mendelson (July 2, 2016). "Box Office: 'Legend Of Tarzan' Snags Surprisingly Mighty $14M Friday". Forbes. Retrieved July 2, 2016. ^ Brad Brevet (June 30, 2016). "'Tarzan', 'BFG' and 'Purge 3' Will be No Match for 'Finding Dory'". Box Office Mojo. Retrieved July 3, 2016. ^ Scott Mendelson (July 3, 2016). "'Tarzan' Box Office: When Best-Case-Scenario Isn't Good Enough". Forbes. Retrieved July 3, 2016. ^ Anthony D'Alessandro (July 3, 2016). "'Dory' Dominates, 'Tarzan' Improves, 'Purge' Excels As 'BFG' Falls: July 4th Weekend B.O. – Sunday Update". Deadline Hollywood. Retrieved July 3, 2016. ^ a b c d Tartaglione, Nancy (July 5, 2016). "'Tarzan' Takes $19.3M In First Offshore Swing; 'Resurgence' Rises To $175.8M; China Shells Out For 'TMNT2' – Intl B.O. Final". Deadline Hollywood. Retrieved July 6, 2016. ^ Brooks Barnes (July 3, 2016). "'The BFG' Stumbles as 'Finding Dory' Rules Box Office". The New York Times. Retrieved July 4, 2016. ^ Kozlov, Vladimir (July 5, 2016). "Russia Box Office: 'Legend of Tarzan' No. 1 With Soft $3M; 'BFG' Places Second". The Hollywood Reporter. Retrieved July 5, 2016. ^ Hyo-won, Lee (July 6, 2016). "South Korea Box Office: Local Comedy 'Familyhood' Tops 'The Legend of Tarzan'". The Hollywood Reporter. Retrieved July 6, 2016. ^ a b Nancy Tartaglione (July 12, 2016). "'Ice Age' Leads Studio Pics; Chinese Summer & 'Sultan' Kick Off – Intl B.O. Final". Deadline Hollywood. Retrieved July 12, 2016. ^ Nancy Tartaglione (July 17, 2016). "'Ice Age' Charts $53.5M Course To Lead Frame; 'Ghostbusters' Calls Up $19.1M In Offshore Bow – International Box Office". Deadline Hollywood. Retrieved July 18, 2016. ^ a b Anita Busch (July 25, 2016). "'Star Trek Beyond' $30M Debut; 'Lights Out' $8.5M; Jackie Chan's 'Skiptrace' Nails $64M Bow – Int'l Box Office Final". Deadline Hollywood. Retrieved July 26, 2016. ^ Nancy Tartaglione (July 31, 2016). "'Jason Bourne' Supreme With $50.1M Bow & Franchise Records – Intl Box Office Update". Deadline Hollywood. Retrieved August 1, 2016. ^ Patrick Brzeski (July 24, 2016). "China Box Office: Jackie Chan's 'Skiptrace' Rockets to $60M". The Hollywood Reporter. Retrieved July 26, 2016. ^ Patrick Brzeski (August 30, 2016). "China Box Office: Growth Returns in August After Prolonged Downturn". The Hollywood Reporter. Retrieved September 3, 2016. ^ Patrick Frater (July 24, 2016). "China Box Office: Jackie Chan's 'Skiptrace' Leaps to $60 Million Opening". Variety. Retrieved July 26, 2016. ^ Nancy Tartaglione (August 7, 2016). "'Suicide Squad's $132M Offshore Bow Sets August Records; 'Pets' Passes $500M WW – International Box Office". Deadline Hollywood. Retrieved August 7, 2016. ^ "The Legend of Tarzan (2016)". Rotten Tomatoes. Fandango Media. Retrieved August 22, 2018. ^ "The Legend of Tarzan Reviews". Metacritic. CBS Interactive. Retrieved July 17, 2016. ^ Dargis, Manohla (2016-06-30). "Review: A 'Tarzan' With a Few Twists in the Hollywood Vine". The New York Times. ISSN 0362-4331. Retrieved 2016-07-08. ^ "The Legend of Tarzan". Retrieved 2016-07-08. ^ Debruge, Peter (2016-06-29). "Film Review: 'The Legend of Tarzan'". Retrieved 2016-07-08. ^ Hoffman, Jordan (2016-06-29). "The Legend of Tarzan review – an inherently problematic remake". the Guardian. UK. Retrieved 2016-07-08.